A delightful, broad-ranging treatment of the varied life and career of a female leader of a punk rock band in the late 1970s. Having recently interviewed Somerville-based filmmaker Tim Jackson about his own career and his upcoming film, When Things Go Wrong – The Robin Lane Story, it was finally a great pleasure to get a chance to view it. It was shown in a benefit screening at the Regent Theater in Arlington which included, as a bonus, a performance by Robin Lane and The Chartbusters, the band of which Jackson was a member in the 1970s and which focuses much of the story of the film. This was not only a chance to see this intriguing film and to hear some great music, but also to celebrate, with what seemed like an entire generation of mature rockers, the spirit of an age that has now been framed by a few decades. The film itself is a very suggestive, interesting, many-sided affair. 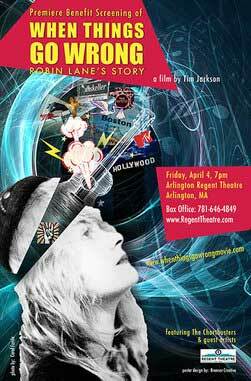 As the telling of Robin Lane’s story, it weaves together a number of different tales. 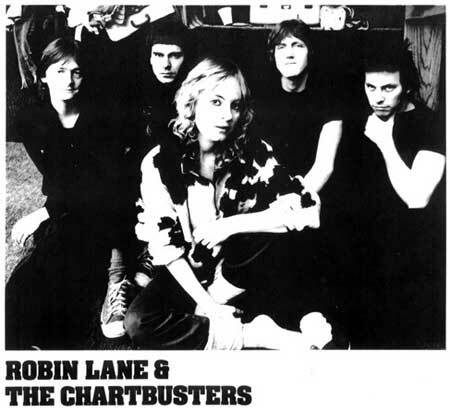 There is the exploration of Robin Lane’s involvements over the years, including her time traveling and recording with the Chartbusters. But the film opens and closes with a profile of her current work with groups of women who are using songwriting as a vehicle for dealing with trauma, a testament to Lane’s continuing desire to work helpfully and constructively through an artistic lens that gathers light from her own insights in the face of personal challenges. One of the central threads in the film looks at Lane’s ups and downs in the rock and roll world, acknowledging her distinctiveness, in the late 1970s, as the female leader of an otherwise male punk band. As well, there is a sketch of the unfulfilled promise of Lane’s recording contract and associated tour with the Chartbusters and a consideration of some of the reasons for that. If anything, the film suggests, Lane’s identity as a female punk-rocker was not strong or vivid enough for the record company to continue to promote her. Despite Lane’s ambitions, When Things Go Wrong gives a sense of the ruthless judgment of a rock and roll marketing world which sought clarity of image at the expense of more varied artistic inclinations of the sort Lane exhibited. Jackson’s film does a good job of giving a rounded perception of Lane’s character in that regard. On the one hand, it suggests that she was ambitious and directed enough to take on the punk mantle as a kind of challenge. Wanting to make a statement in that world, Lane gathered a highly competent band and sought to craft a particular version of punk tunelessness but with extremely adept musicians. On the other hand, Lane’s exploratory qualities and varied expressions of talent, as Jackson shows, made her vulnerable to a kind of haziness of image that even her own agent, as quoted in the film, acknowledges. Many other strands weave this complex and interesting tale, including allusions to various traumatic elements of Lane’s childhood, to unsettling personal relationships, and, in particular, to the child which, as a young woman aspiring to a career in music, she gave up for adoption. As well, Jackson observes the importance of religion in Lane’s life and outlook, noting that her identity as a born-again Christian – which her band did not share – added a curious dimension to her aspirations as a punk star. Woven as well into the film’s story of Lane, her personal and professional turns of fortune, and the story of the band, is something of a picture of rock and roll of the era. So, it is also interesting as a kind of generalized history as well as a personal portrait. The film, indeed, is a many-spendored thing, and one is likely to find greatest appreciation by tuning into its broad sweep of concerns. It does not focus quite as specifically on answers to particular questions about Lane, her music or her era, as to give a generalized portrait of the artist, the personal and the cultural landscape in which she appears. As a film with a lot of mixed pieces of contemporary and archival footage, some forms of technical tuning – greater attention to sound-mixing for example – might be helpful for its more general future release. Nonetheless, to some degree, the film’s somewhat rough texture is entirely consistent with the punk material it evokes. In addition to the music included in clips, additional music by film composer John Kusiak provides subtle texture and landscape throughout. After the showing, Jackson, Lane and Laura Colwell, the editor of the film, answered questions, giving a warm sense of the collaborative nature of the project. Robin Lane and the Chartbusters performed afterwards and it was really a pleasure to hear them. They can still turn out some serious tunes, and the adeptness of the technique and the underlying verve were apparent throughout. Lane also sang by herself and in various combinations with other people. When listening to her perform, I drew a personal inadvertent observation in light of the film’s questions about Lane’s musical identity. I felt, as I listened, that what came out most strongly was a voice and sensibility that seemed most geared, oddly enough, to country music. Lane’s plaintive vocals and the personal and longing quality of her music, the twang of her guitar, gave me the sense that had country music been a somewhat hipper thing back in the 1970s that Lane would have been a natural for it, that musical world providing a more suitable context for her rich voice and for the combination of personal narrative, emotional tone and religious sensibility that seem most her own.